As well as the library, we end up with unfamiliar books coming home from school or nursery in the boys’ book bags from time to time. 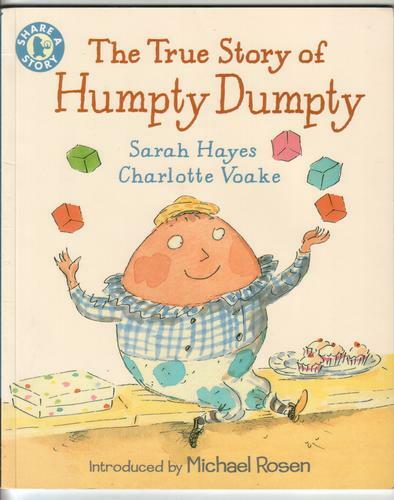 The True Story of Humpty Dumpty by Sarah Hayes and illustrated by Charlotte Voake (Walker Books, 1987) is a case in point. Part of the “Share a Story” series, it has an introduction from Michael Rosen and hints and tips on sharing stories with young children at the back. Given the publication date, it’s clearly been around a while but I’d never come across it before. Did you know that Humpty Dumpty was a bad egg? Find out what he was really like in this playful twist on a favourite nursery rhyme. So says the blurb on the back, but it left me a little bemused. Humpty Dumpty invites various horses and various men to do various tricks on the wall. Then he laughs at them when they fall off. The king is very cross when he sees all his horses and all his men injured and orders Humpty Dumpty down. Instead “he stood on one leg and juggled with bricks. He did cartwheels and headstands and all sorts of tricks”. And then, of course, he fell off. put Humpty Dumpty together again. We were all left rather baffled by this story – it’s certainly a twist, but rather an odd one Mari and I thought. Still, it’s beautifully illustrated – Charlotte Voake’s pictures are always worth looking out for – and it gave us an opportunity to talk about the unpleasantness of laughing at the misfortunes of others, so I guess that’s something. It’s back to school on Monday again so we’ll see what comes home next time. This entry was posted in Books, Children's Books, Reading, Reviews and tagged Blogathon 2013, books, children's books, funny books, Humpty Dumpty, illustration, Michael Rosen, Nursery rhyme, picture books, reading, recent reads, reviews, Walker Books. Bookmark the permalink.